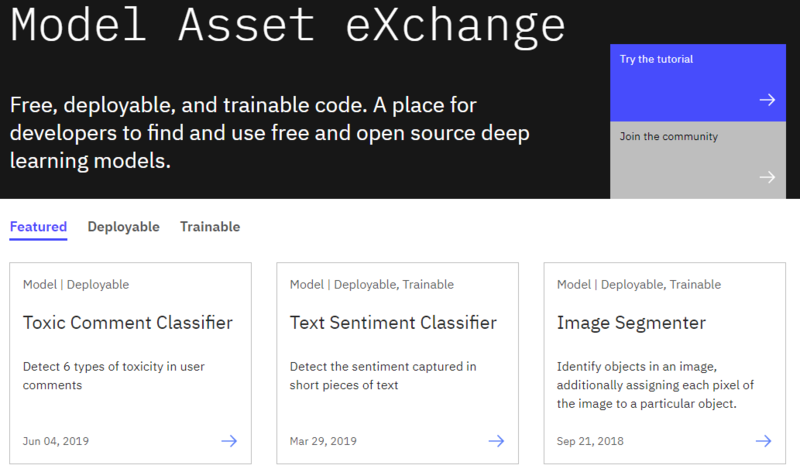 The Model Asset eXchange (MAX) on IBM Developer is a place where you can find and use free open source deep learning models for text, image, audio, and video processing. The curated list includes deployable models that you can run as a microservice locally or in the cloud on Docker or Kubernetes, and trainable models where you can use your own data to train the models. By completing this introductory tutorial, you learn how to deploy a model microservice and consume it in a basic web application. In a terminal window, clone the tutorial repository. If you want to complete module 2 of this tutorial (instead of just reviewing the solution), ensure that Node.js or Python is installed. You are ready to start the tutorial. Deployable MAX model assets implement microservices that you can run on Docker or Kubernetes. If you only want to explore the functions of a MAX model microservice in a local environment, you can run it by pulling the corresponding Docker image from Docker Hub. The pre-built Docker images provide an easy way to explore a model microservice without the need to install any other software (aside from Docker) on your machine. However, because the image is pre-built, you cannot customize the microservice or review its implementation. 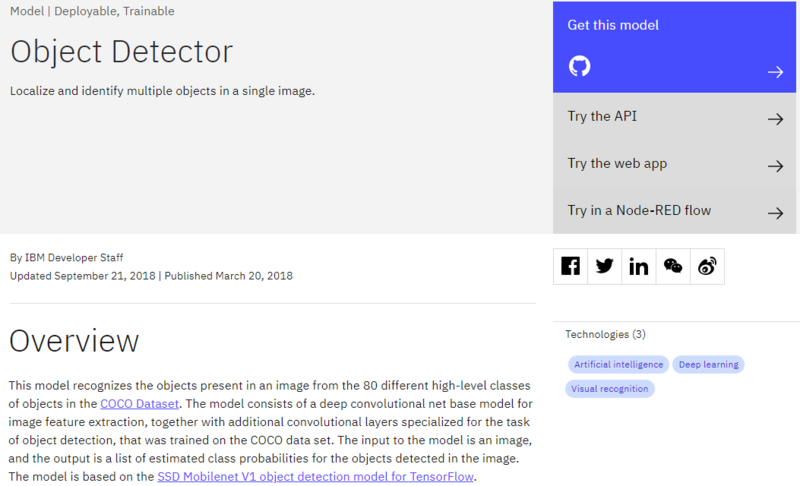 Open the Object Detector model page. Note: You can explore the model service API of some models by clicking the Try the API button. Locate the instructions to deploy the pre-built Docker image from Docker Hub and execute the listed docker run command in a terminal window to start the microservice on your local machine. A status message is displayed after the container has started and the service is available, identifying the URL where the service can be accessed. Open the displayed URL in a web browser, for example, http://0.0.0.0:5000. GET / – Returns the microservice’s Swagger specification. 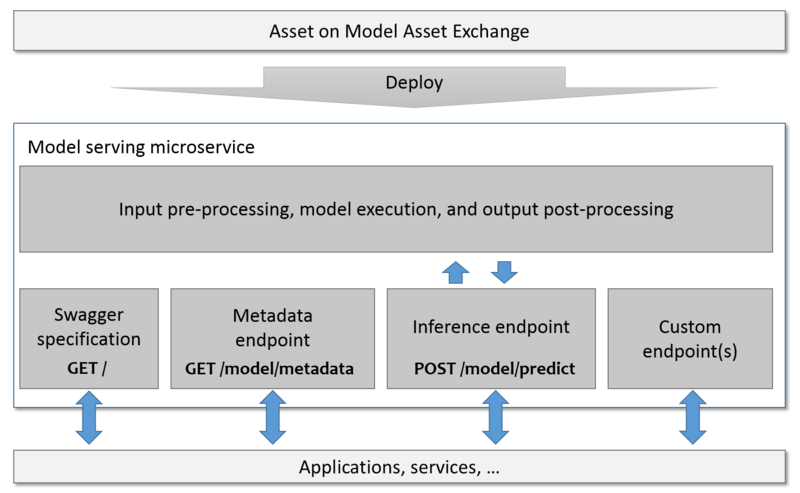 GET /model/metadata – Returns information about the model that the microservice is serving, such as name, description, and license. 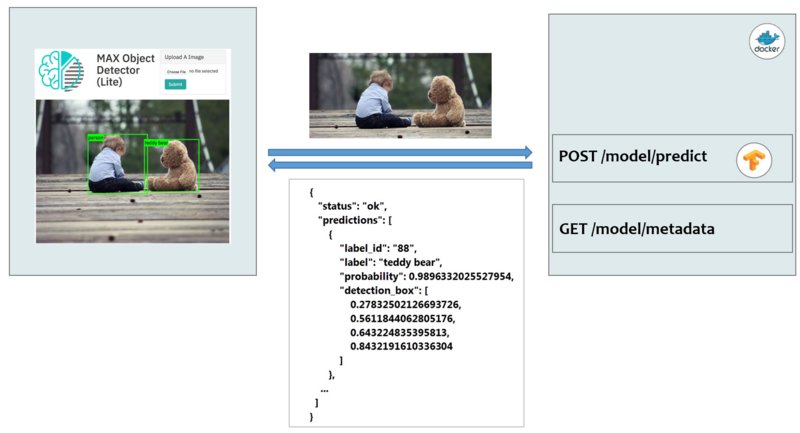 POST /model/predict – Returns the results of a prediction, given the provided input data. Supported input data types and formats vary by model. Refer to the service’s Swagger endpoint description for details. Try the prediction endpoint. You can try the model’s prediction capability by invoking its POST /model/predict endpoint from the Swagger UI or by sending a request using any API client. You can find model-specific example inputs in the model’s GitHub repository. Prediction results are typically returned as JSON. Use the docker ps command to list running containers. Note the CONTAINER ID for the appropriate image. Run the docker stop command to stop the microservice, specifying the CONTAINER ID from the previous step. You can review the Docker image content, such as the model serving code implementation, or customize the Docker image by cloning the Model asset’s GitHub repository. On the Object Detector model page, click Get this model to navigate to the model’s GitHub repository. Clone the source to your local machine. The model serving code is typically implemented in Python by using Flask and a deep learning framework library, such as TensorFlow or PyTorch. Note that the consumer of this service does not need to know which deep learning framework was used because the service API is framework agnostic. docker build -t max-object-detector . During the build process, the required dependencies are downloaded. Note that this might take some time depending on the image you are building. After the build process is complete, it’s time to deploy. Open the displayed URL in a web browser, for example, http://0.0.0.0:5000/. Do not stop the container and do not terminate the terminal window. You will use the container in the next module. In the next module, you’ll learn how to consume a model microservice from a Node.js or Python web application. Ensure that the model microservice is running by executing the following command in a terminal window. In preparation for this tutorial, we have created simple Node.js and Python web application stubs that you will complete by adding the code that is required to invoke the model microservice’s prediction endpoint and process and visualize the results. Clone the Node.js sample application repository https://github.com/IBM/max-tutorial-app-nodejs in a terminal window. Note: If you’d like to review the finished sample application (instead of completing the following steps), check out the solution branch by running git checkout solution in the terminal window. Open the static/index.html, static/js/webapp.js, and app.js files in your favorite editor. static/index.html implements a simple web UI, providing users with the ability to select a PNG/JPG image from their local file system. Locate TODO R1 and review the prediction request payload. The model that you are using requires a PNG/JPG-encoded image file as input and accepts a threshold as optional input. The threshold acts as a filter, removing detected objects from the result set that the model is less certain about. In this sample application, we are overriding the default (0.7) for illustrative purposes with a lower value. Locate TODO T1 and replace the **TODO** placeholder with your microservice’s prediction endpoint /model/predict. Locate TODO T2 and replace the **TODO** placeholder with your microservice’s prediction request method POST. Note: Remember that you can always review the Swagger specification for the supported model endpoints by opening the microservice URL (for example, http://localhost:5000/) in a web browser. Install the prerequisites and launch the application. Open http://localhost:8090/ in your web browser. In Safari: Open the Network tab in the Web Inspector (MacOS: <option><command><i>). In Google Chrome: Open the Network tab in the Developer Tools (MacOS: <option><command><i>). In Mozilla Firefox: Open the Network tab in the Web Developer Tools (MacOS: <option><command><i>). Choose a sample image from the assets/ directory (or any other PNG/JPG image you might have stored on your machine), and click Detect Objects. If you’ve defined the endpoint URL and request method properly, a message appears indicating that no objects were detected. This is expected because you have not yet customized the code that processes the microservice response. Locate TODO T3 and replace the **TODO** placeholder with predictions. Reload http://localhost:8090/ in your web browser and try to detect objects again. 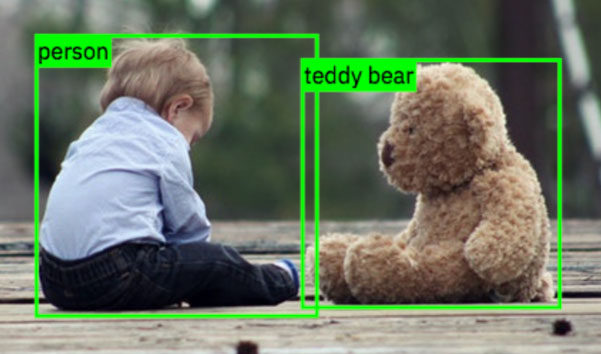 The application should display bounding boxes around detected objects along with the label. Clone the Python sample application repository https://github.com/IBM/max-tutorial-app-python in a terminal window. If you’d like to review the finished sample application (instead of completing the following steps), check out the solution branch by running git checkout solution in the terminal window. Open the app.py file in your favorite editor. The application implements a simple Flask-based web server that serves the static application content (web pages, stylesheets, and so on) and invokes the model microservice’s prediction endpoint. Remember that you can always review the Swagger specification for the supported model endpoints by opening the microservice URL (for example, http://localhost:5000/) in a web browser. Install the prerequisites and launch the application in the terminal window. Choose a sample image from the assets/ directory (or any other PNG/JPG image that you might have stored on your machine) and click Detect Objects. Locate TODO T2, uncomment the next line, and replace the **TODO** placeholder with predictions. In this tutorial, you learned how to deploy a model microservice and consume it in a basic web application. It explained how you set up your environment and run and consume microservices.